The typical crossover in this segment is versatile, but generally sedate. 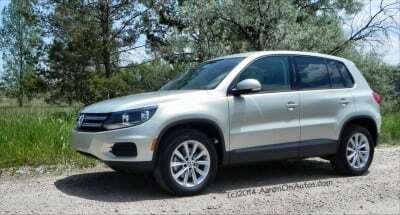 The 2014 Volkswagen Tiguan is not your typical crossover, however, and is more akin to a sports hatch than an SUV. In many ways, it is the low-cost Porsche Cayenne of the segment. 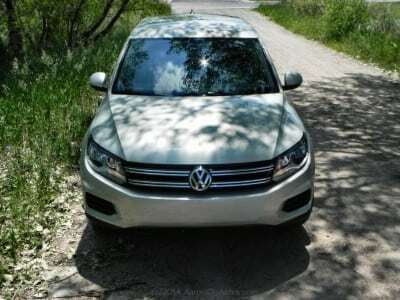 The 2014 Volkswagen Tiguan, as we drove it in its SE package with 4Motion all-wheel drive, is different from most of the competition in the segment. It’s far sportier than many, but has its down sides as well. This is the sixth year of the Tiguan’s current-generation and that shows in many respects, but is not as detrimental as that kind of age might be to some other vehicles. 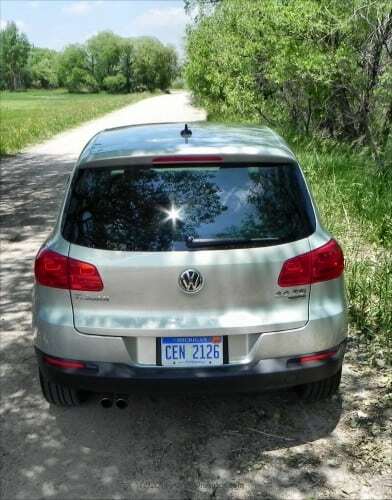 Most of the emphasis in this 2014 Tiguan is on the drive dynamics and overall road feel. This is a spirited crossover with a great exterior look. It’s still practical, of course, but has some dated aspects that may hold it back. 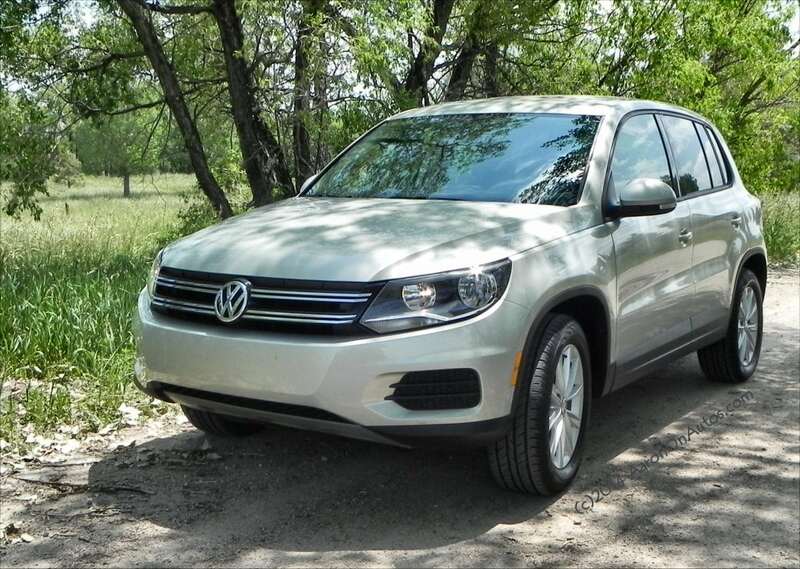 It may seem underpowered on paper, but the 2.0-liter four-cylinder engine that drives the 2014 Tiguan produces 200 horsepower and 207 lb-ft of torque and it’s no slouch. The six-speed manual transmission offered in the base model is also unusual in this segment, though our test model has the six-speed automatic. 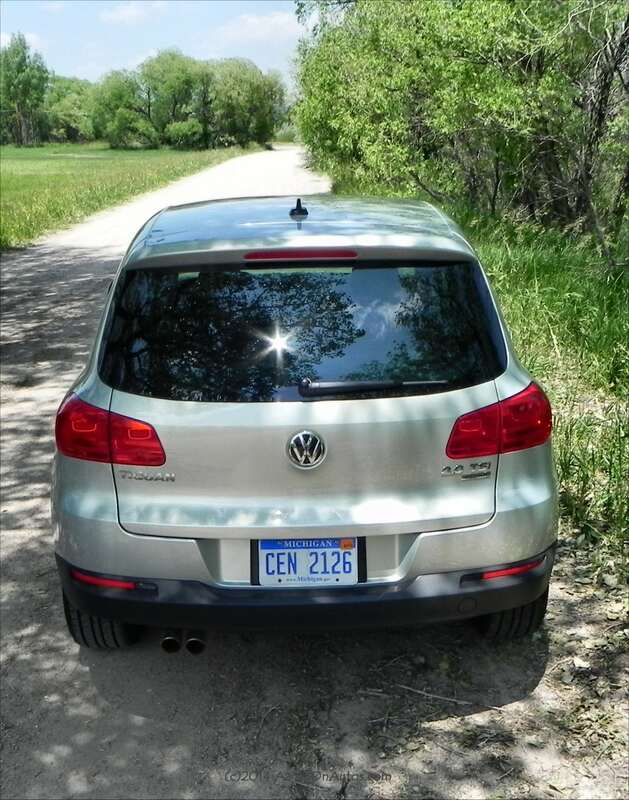 The EPA gives the 2014 VW Tiguan a 23 mile per gallon rating overall (combined), with a 20 mpg city and 26 mpg highway rating. 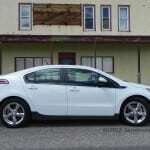 Our real-world driving showed that this is achievable, though our best mileage was about 20 mpg overall. It’s hard to drive the Tiguan in an eco-friendly way. It just seems to enjoy going fast. The reason for it being difficult to gain the highest fuel economy in the Tiguan is simple: it’s exceedingly sporty. Even without the available R-Line packaging, which adds even more sport, our SE package was full of get-up-and-go. The acceleration and sport handling integral to the build of the 2014 Volkswagen Tiguan is without equal in this segment. It’s truly fun to drive, and that’s saying a lot for a small crossover. To further this, the Tiguan has a quiet ride that is also unusual for the segment. Road noise is minimal and on the highway, the 2014 Tiguan’s poise is similar to many luxury crossovers we’ve driven. 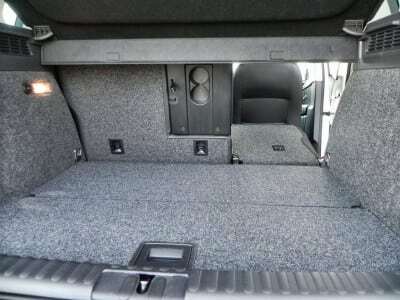 The interior of the 2014 Tiguan SE package is nicely done, though not ostentatious or stand-out. Some of the electronics and ergonomics are a bit dated, but not horribly so as might be expected of a design that’s six years on. Seating and passenger space is roomy and well-adorned. 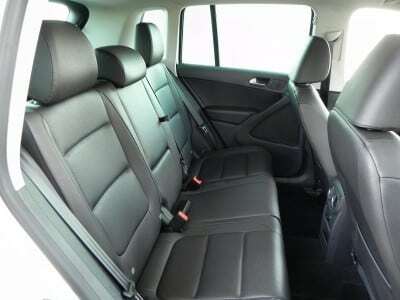 There is ample room for those in the cabin, though seating for five is probably not a full-time ideal in a crossover this size. 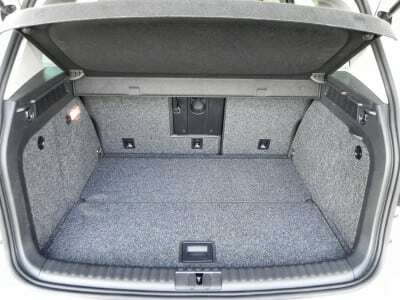 Cargo space is limited in comparison to many rivals, but still adequate for most people’s needs. With two adults, two children in safety seats, and a couple of week’s worth of groceries in the back, the Tiguan showed itself to be more than capable as a family hauler and daily driver. More details can be had from my interior review video below. 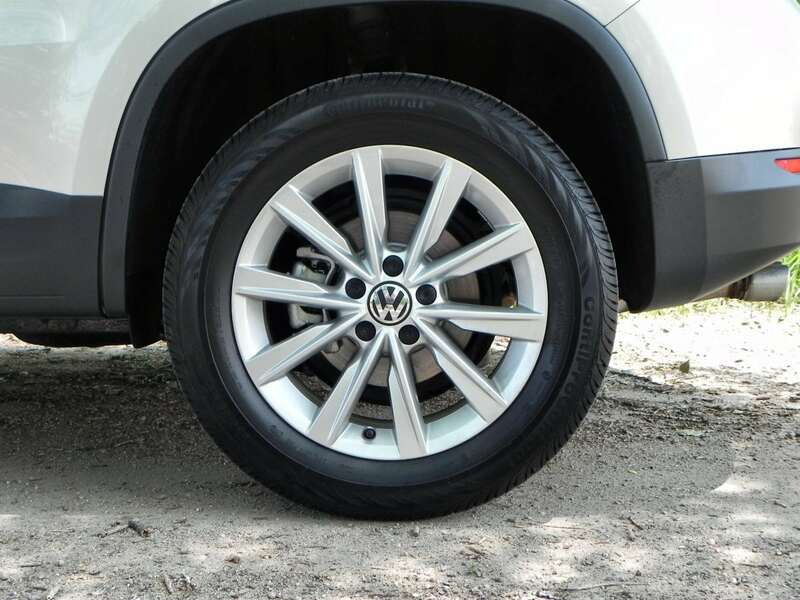 Did we mention that the 2014 Tiguan is sporty? It bears repeating. This fun little crossover is a comfortable ride that delivers a good experience from all seating positions. Although not the most comfortable or most plush on the market, the Tiguan holds its own against competition and proves its price point with its amenities and feel. 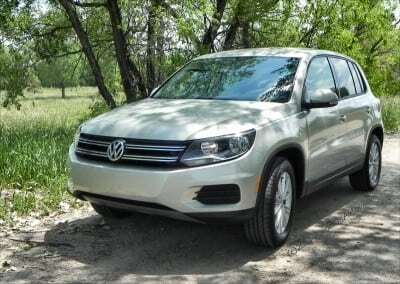 On the highway, the Tiguan is quiet and the ride smooth, but responsive. 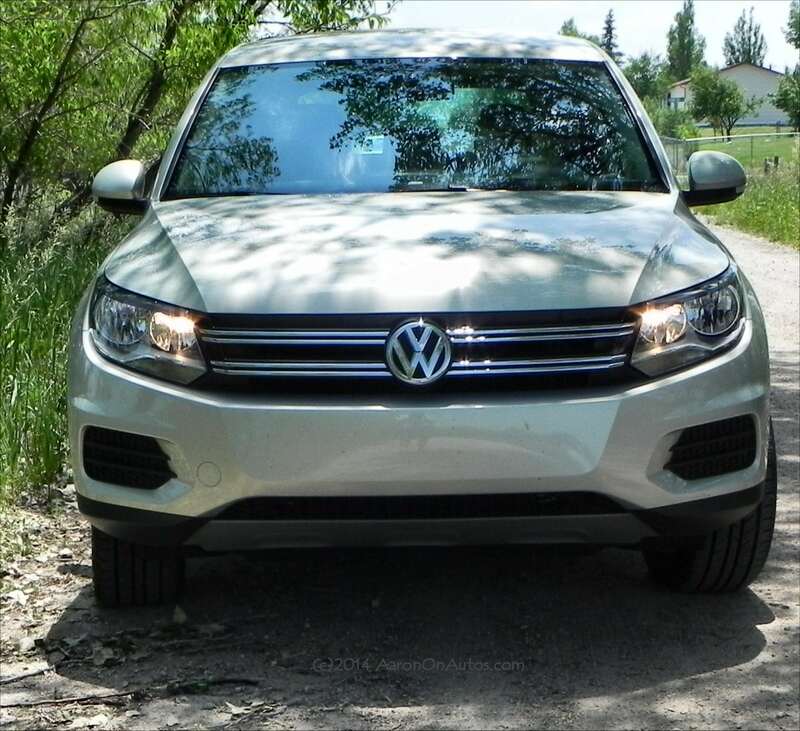 In town, the VW Tiguan is easy to get around in, though our test model did not have a touch screen or rear-view camera, but visibility is good. There are a lot of competitors in the midsize crossover markets. 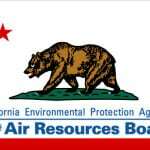 The Mazda CX-5, Ford Escape, and Kia Sportage are examples, as are the Subaru Forester, Nissan Rogue and Mitsubishi Outlander Sport. In looks alone, the Sportage and Outlander are strong competitors, while in drive dynamics, the Escape (especially in the EcoBoost package) is a solid contender. The Forester is a segment leader in fuel economy, however, which is taking a front seat in today’s market. Very sporty crossover with characteristics similar to many sedans. Well-outfitted and a good everyday vehicle. Dated interior that is due for an update. Pricey in comparison to many rivals, but offers premium feel in return. Bringing it all in, the 2014 Volkswagen Tiguan is a fun drive with a great amount of versatility and a great ride. Although it has some things that need to be upgraded, it is not nearly as dated as its age might assume. 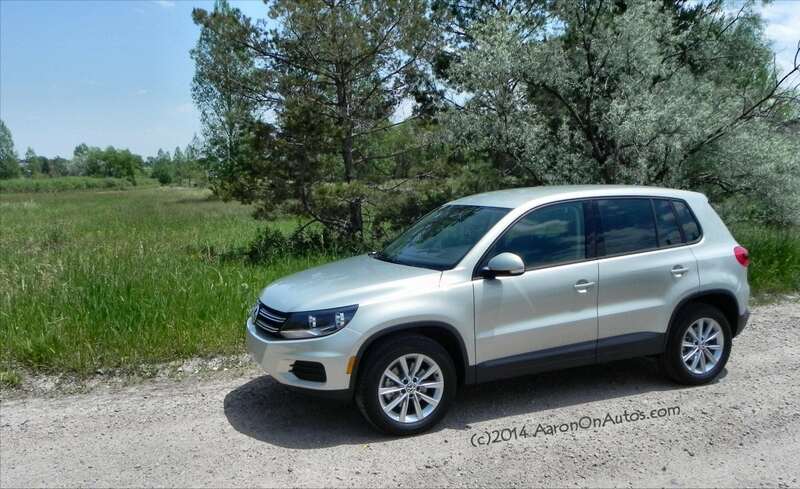 Volkswagen did well with this 2014 Tiguan. 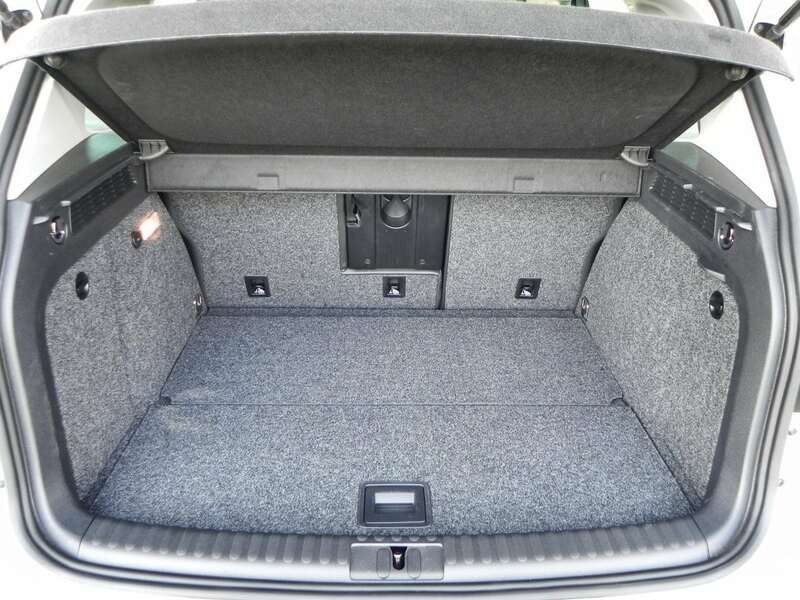 The Tiguan was a manufacturer’s press loan, driven for about a week. 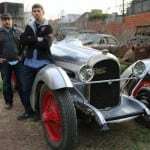 During that time, it was used as an everyday family vehicle in town, on highways, etc. A total of about 248 miles were put on the vehicle. 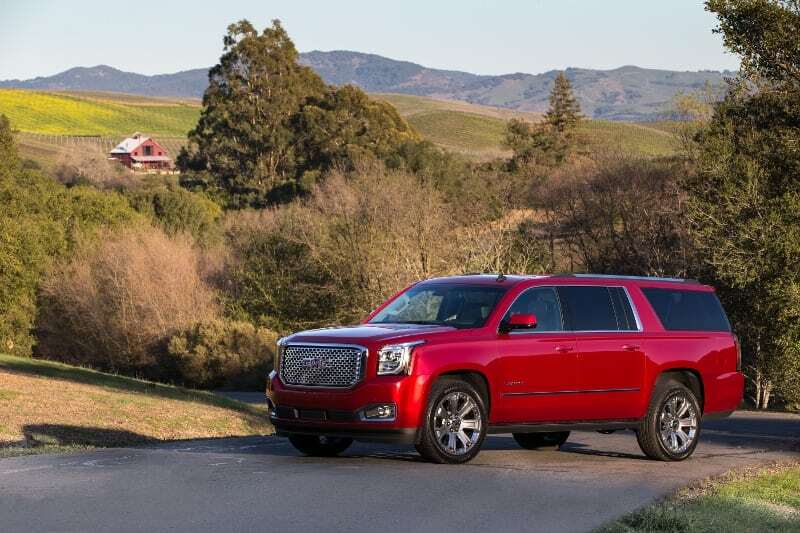 For weaknesses you forgot that it will disintegrate when 4,000 miles roll onto the odometer. 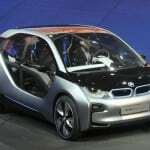 🙂 Germans are good at making solid, technologically advancement, and good handling vehicles… but they are not reliable. 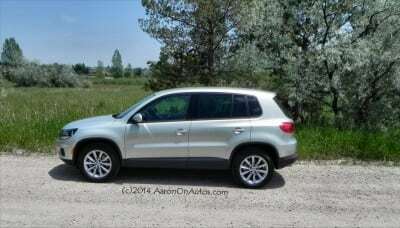 The VW Tiguan doesn’t seem like a bad SUV but it just doesn’t seem like consumers consider it in the segment. 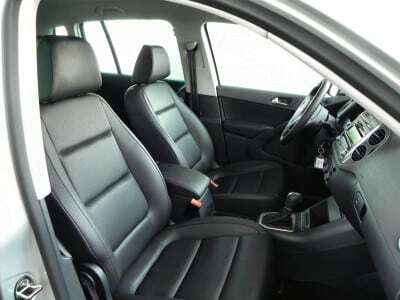 I think the Tiguan’s biggest problem is that the interior bling factor is lacking and it’s one of the highest priced crossovers in the segment.